This year, there are two options for fundraising pages: Crowdrise and Facebook. For information on how to create fundraising pages please visit Fundraiser instructions- Crowdrise and Facebook. If you would like assistance setting up a fundraising page please contact Danielle Pickett at 781-259-1177 or danielle@lovelane.org. Eight-year old Reese has Phelan-McDermid Syndrome, a rare genetic disorder that affects her development in many ways, most noticeably in her speech and muscle tone. 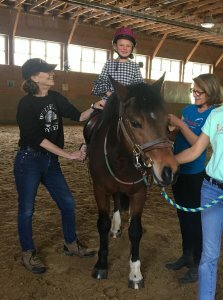 At age two her doctors recommended therapeutic riding at Lovelane. Now, six years later, with confidence and strength, Reese tells the horse to “go fast please” and can sit tall when riding. The bond between Reese and her therapy team (including the horses!) has built a trusting and heartwarming relationship that encourages Reese to succeed with each challenge. This year all proceeds from the Run will support Lovelane’s Tuition Assistance Program, so that children like Reese can receive the highly beneficial therapy at Lovelane regardless of their family’s financial situation.